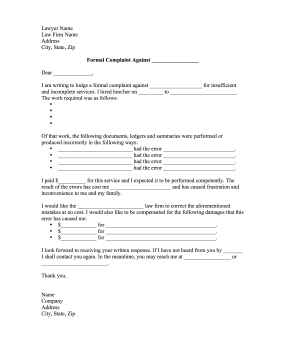 When attempting legal action over a conflict, fill in this formal complaint letter addressed to an attorney. • ___________________________ had the error __________________________. I paid $__________ for this service and I expected it to be performed competently. The result of the errors has cost me ______________________ and has caused frustration and inconvenience to me and my family. I look forward to receiving your written response. If I have not heard from you by _______ I shall contact you again. In the meantime, you may reach me at _________________ or ________________________.